August 1, 2017 at 12:05a.m. A prosecutor said during the arraignment for a couple accused of keeping the body of a woman in a freezer that the female suspect assumed the life of the victim. Bond was set at $1 million each Monday in municipal court by Magistrate Anthony Sertick for Katrina Layton, 34, and Arturo Novoa, 31. They were arrested after the body of a woman was found in a freezer inside a home in Campbell over the weekend. Police believe the body may be that of Shannon Elizabeth Graves, who has been missing since early this year. Detectives are awaiting identification of the body and information about how she died. Graves was Novoa’s girlfriend, said city Prosecutor Dana Lantz. But Lantz said Layton moved in with Novoa at Graves’ Mahoning Avenue apartment and started assuming Graves’ life. About the time police think Graves went missing, Layton moved into Graves’ apartment, used her car, phone, credit cards and took care of Graves’ dog, Lantz said. Layton was “basically assuming [Graves’] life and her belongings with Mr. Novoa,” Lantz said. When detailing the facts of the case to ask for a high bond, Lantz focused most of her remarks on the freezer in which the body was found. Lantz said the freezer was moved to the Campbell house on Deavitt Avenue on July 24 from a home on East Ravenwood Avenue, where the couple was paying rent. A friend of Novoa’s on Deavitt Avenue took the freezer for Novoa, because Novoa had been complaining that there were electrical problems at the East Ravenwood home. The people who live in the Campbell home are not suspects and have been cooperating, police said. 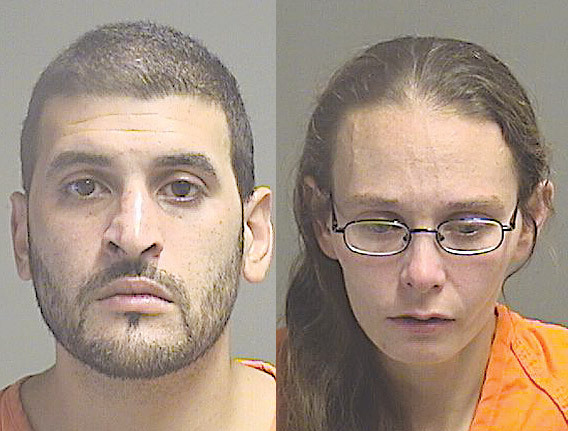 Lantz said the couple were paying rent at the home even though they did not live there – and there was nothing in the home other than the freezer and a couple of pieces of furniture. Layton told police she wanted a freezer for food because her refrigerator was bad. But Lantz said that does not make sense because they were paying rent at a home despite not living there, where the freezer originally was. “They had a freezer to store food in, but they didn’t even live there,” Lantz said. Lantz also said Layton, who was arraigned first, asked for a court-appointed attorney despite having money to pay rent at two places. While Layton was arraigned, she repeatedly talked under her breath and at one point could be heard saying: “This isn’t correct.” She was warned by Magistrate Sertick to be quiet. “I’ve had enough of your comments,” Magistrate Sertick told her. Layton’s family was in the courtroom and broke into tears when her bond was announced. They continued crying when they left court, and their sobs could be heard in the courtroom even after they were in the hallway. They declined to comment before the arraignment, other than to say they feel bad for Graves’ family and that they think Novoa set up Layton. The freezer was found about 4:30 p.m. Saturday after a friend of Novoa’s who had been keeping it for him became suspicious because it had been locked for a week. Lt. Doug Bobovnyik said the person who found the remains was able to remove the hasp on the freezer because the lock was not properly installed. The friend opened the freezer, saw the remains and called police. Lantz said Novoa denied having any knowledge about the freezer, but he had the key to the padlock that was on it. August 1, 2017 5:01 p.m.
July 31, 2017 2:08 p.m.
August 2, 2017 12:10 a.m.